A unique single chair by an unknown Brazilian designer. The chair has an iron base that has springs to it adding a bounce to the seat. The seat is upholstered in leather and is shaped like a tear drop. Brazilian 1970s 3-seat sofa with bent rosewood curved side frame, loose cushions and low profile. Newly upholstered in a soft grey toned leather. Rosewood has been refinished. Italian, circa 1970. 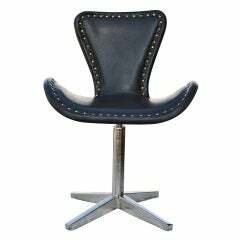 A stylish pair of soft, black, ruched leather and nickel plate chairs with comfortable rounded backs. In excellent condition. Chic 1970s brass frame rocking chairs with new black leather upholstery. Fully restored. Pair available, priced individually. 1970s black leather reclining chair with foot stool. Brown leather upholstery. The chair is in good original condition with some signs of use due to age.